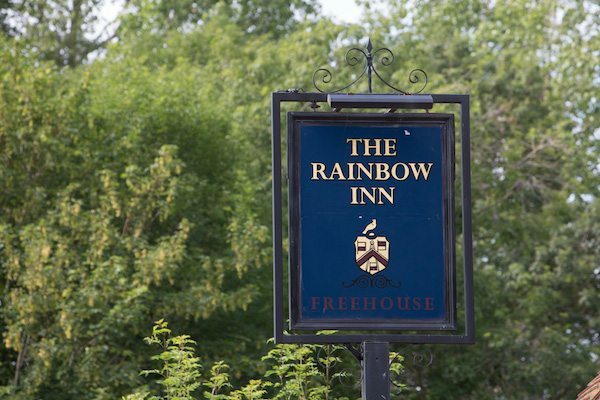 When I told my mum where I would be visiting this week, she happily told me that The Rainbow Inn in Cooksbridge was the first ever pub I was thrown out of. I mentioned I had no memory of this and she replied that I wouldn’t have – I was only three months old at the time, and apparently not even babes in arms were permitted in pubs during the early 80’s. Luckily times have changed and how pleased am I that I have finally made my way back! 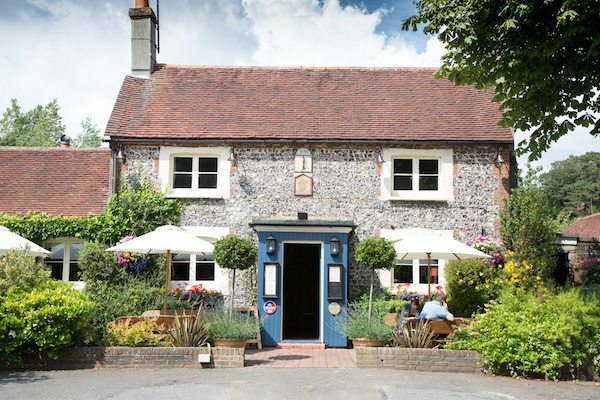 From the moment you approach the pub situated just a twenty minute drive from Brighton you are not disappointed – the old flint building is beautiful with vibrant hanging baskets and window boxes. 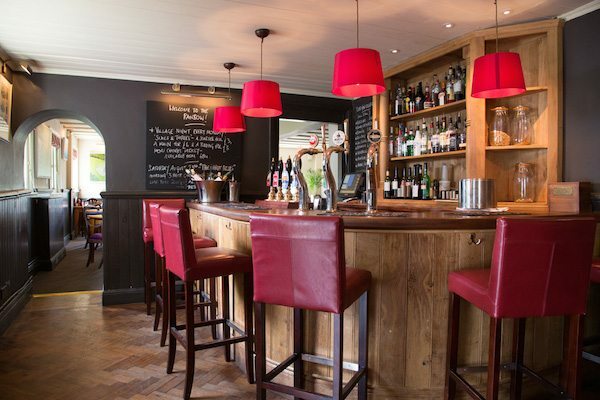 On entering the cosy bar you are met by a roaring log fire and big sofas. We were warmly greeted and shown to our table which had the most amazing views across fields towards the South Downs and Ditchling Beacon – perfect as the sun was setting. The restaurant itself is lovely, with dried hops hanging from the eaves and local artist paintings hanging on the walls. There are two sections to the dining area, with the larger room curtained off during the quieter nights, offering the guests an intimate dining experience. There were three other tables already sat and ordering when we arrived so with the gentle background music playing the place had a real buzz to it. The manager, Alex introduced himself, explained his background and offered any advice that he could offer us regarding the restaurant and menu. A former club promoter he is now relishing the quiet life and the relatively early nights compared with the buzz on the Brighton scene. He worked the room really well, making sure he spoke to all the diners, finding out a little about them and just making everyone feel welcome. There are two burgers on the menu, so of course Myself and my partner went for one of each. I chose the Beef burger, Sour Dough bun, Monterey Jack cheese, Burger sauce, Iceburg lettuce, Tomato with Sweet and Sour onions (£13.00), and my partner had the Fried Chicken Burger, Sour Dough bun, Slaw, Ginger mayo, Sticky sauce and Iceburg lettuce (£13.00). Both were served with fries. 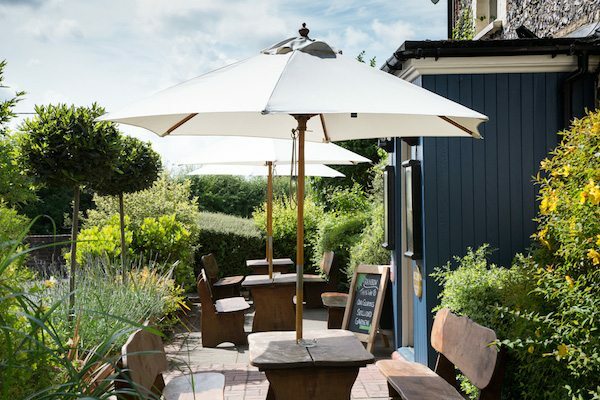 The meat is supplied by Poynings Grange Farm, so local to the Rainbow Inn that you can see the farm to the north of the car park. In fact all of their produce is supplied from within the wonderful county of Sussex, and a list of their suppliers can be found on their web page. 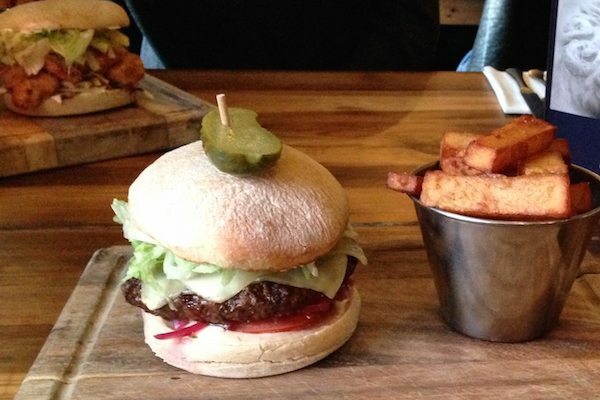 The burgers both looked amazing when served and very big, I cannot see anyone complaining about the portion sizes here! 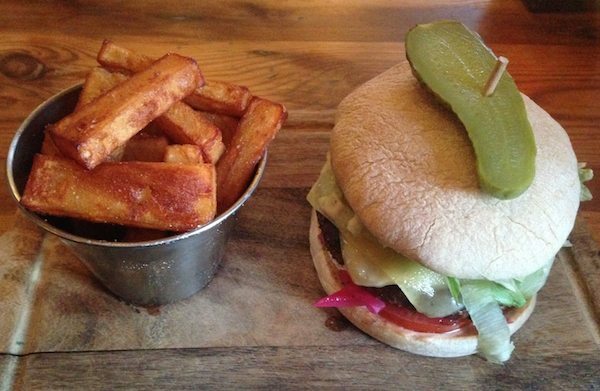 The burgers were presented simply on a wooden chopping board with the fries served in a stainless steel pot. No fuss here – its all about the well cooked food. We were offered the choice of mayonnaise or ketchup as an accompaniment. The beef burger was served medium and was delicious. It was seasoned to perfection and cooked beautifully. The Monterey cheese together with the sweet and sour onions added a real difference to the run of the mill burgers you can grab anywhere. I particularly liked the way that the gherkin was presented on top, a great way to present a burger differently, but also perfect for fusspots like me who don’t particularly like them in their burgers and can add just enough if they wish to taylor their dish to their liking. The chicken burger was a revelation! When Alex told us when ordering that the Chicken burger was the more popular one of the two, we were both very surprised. I’ve always thought that people went for the chicken option if they weren’t big meat lovers – I mean lets face it, if you go for a burger you want something that’s really meaty and not light like chicken – right? Wrong! This burger was packed with tender chicken pieces that had been lightly fried in breadcrumbs with a light coating of pepper, this with the ginger mayo really packed a punch in the flavour department and wowed the both of us. However, if you didn’t think these burgers could offer anymore surprises, then lets just take a moment to mention the bun! The sour dough worked amazingly, nice and soft and so subtle in taste it didn’t distract from the flavour combinations that were wowing you. It was also a welcome change from the brioche bun that is so commonly used and can be quite sweet. All in all both burgers did not disappoint. Now after these two beautifully presented and tasty burgers, we thought we’d push the boat out and give their desserts a try too and I would definitely, recommend to any to try and leave a little room for one. 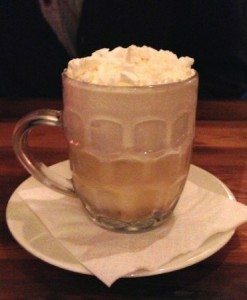 My partner decided upon the Lemon Meringue sundae, which was so light and creamy and really was a lovely way to end a meal. I of course, went for the chocolate option and had the Chocolate brownie, with vanilla ice cream, pistachio and Frangelico syrup – delicious. All in all we both had a wonderful time and I’m so glad I made it back from the unfortunate incident way back in the 80’s to enjoy the good food, attentive staff and amazing ambience. I’ll try not to leave it so long next time!